TV journalism is that branch of general journalism that focuses and specializes on visionary media. I am journalist Khalid Osman and I wrote this article for my daughter’s TV cinema website. Television journalism has the same editorial and formal essentials general journalism has, but it diverts in-out and through the methods it uses for editorial and formal essentials to broadcast programs of news nature on televisions, either through digital cable TV, or dish satellite TV. The aesthetics of TV journalism is subtle and with the visionary techniques of the flowing pictures, montages, subtitles news tool bar, artworks like slide shows and powerpoint and flashbacks from the archives (which could be entertaining, sometimes), with all of that it has direct and deep effects on spectators more than any other media. Radio journalism is somewhat different and it does not produce such strong effects on the audience, as TVs do. Newspaper and magazine journalism are also different, as they are limited to the manuscripts and the still pictures they publish. So, they have little effects compared to TV journalism. In a nutshell, other media sources don't produce such strong effects. 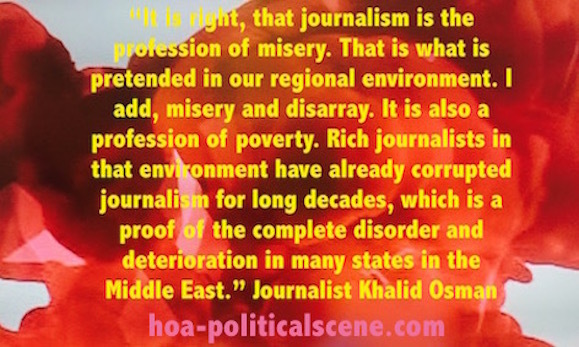 When journalism started back away before 1781 and before the development of TV journalism, it was a French invention with the French first word for such profession as, "journalisme". Then the English term takes over since that date by removing the last "e" from the French term to describe the process of writing and editing of the news on the public press the media produces. The process ends as informational. This is why publishing information is pertinent to journalism. 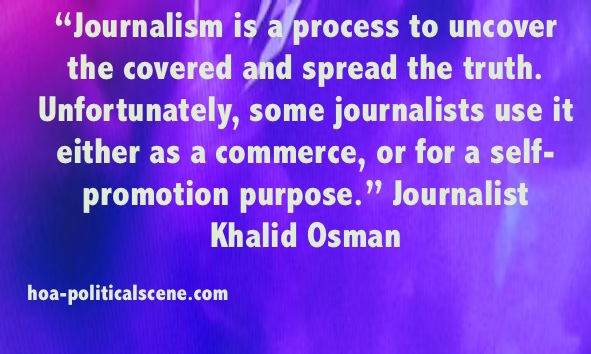 So, journalism itself appears as a process of gathering, citing, processing and spreading something of informational nature, or news nature for reading, hearing, or seeing by others through texts, or pictures. However, the citation and spreading of the news take place on traditional communication channels, such as newspapers, magazine, radios and TVs. As stated that the collection of news and the spreading process divers between the media sources even regarding the tools each of the sources of the media uses, it divers also between traditional media and modern media, such as the internet. The internet has many tools to use to distribute media. The traditional tools include blogs and websites many people build, or use, although only few of them are somehow relevant to TV journalism. This is only when the blog, or the website presents informal issues streaming them as television journalism on some videos, slideshows, or powerpoint. Development comes with other tools such as videos to spread through many networks online and streaming internet TV channels through some cable internet TV providers, or such film streaming providers, as the Amazon best TV, or news streaming such as the international news networks at the BBC and the CNN. The recent phase of this development we are seeing now and it’s growing with the modern devices many people are crazy to have is on the apps, iBooks, Kindle, podcast and vidcast, although the general use of such devices and tools is not precisely for TV journalism. However, any device, or tool mentioned in this regard could be used as a television journalism tool to build new experimental environment for the TV journalism to spread through the new devices, applications and software. I am right here at this spot to see how I could experiment with the development of technologies to use for television journalism. How Effective TV Journalism Works? The broadcaster collects the news from the public news resources distributed through the public news channels, or from the news resources her or his media has in different locations locally and internationally, or from the public. The broadcaster could also make the news, as I did in 1992 when I created the idea of the martyr’s tree and engaged the public to plant more than 5.000.000 martyr’s trees in Eritrea on different national anniversaries and even on different family’s anniversaries. During these activities and while making the news, I of course engaged the media to cover them and as a journalist, I also covered some of them and conducted many interviews and reportages about them. This was an interactive conduct of journalism. So, when the news are made the media tools got to work to cover them. The newspaper journalists, the radio journalists and the television journalists go out to hunt for the news, all using the required process each media have. One way, or another an interactive and inspired journalist who knows how the process of journalism works should sometimes create the news. As journalists, we sometimes fabricate them. But, of course not all fabrications are good. When the news are collected, the journalist engages in editing and arranging the news and uses the pictures she, or he may have. The editing and the arrangement of the news, as stated somewhere here diver between the newspaper, the radio and the television. The television journalist edits the news in papers and then adds them to the moving, or still pictures, or edits the news on the videos the cameraman has shot. She, or he uses a technical process and gets through it to add something from the archives, or to add some effects. Direct television news, however, is different, when the television journalist sits in front of the camera to read the news. The news team prepare all the technical requirements through the montages and maybe add vocal effects, slides from the archives and other items. The male, or the female who sits behind the camera may not be a specifically a journalist, but only a reader to what the television journalists have collected. The other technical staff do the hard job of preparing the news to be broadcasted. How to Project Effective TV Journalism? As every writing process requires papers, your television journalism plans also requires papers. To do effective television journalism, you'll need to work first on papers. See the news you read through your TV news bar, or hear on news TV channels? They are prepared first on papers. Even if you wanted to use your camera, or camcorder to shoot news, you will need papers including plans, papers including details of every single journalism project you want to carry and papers including the tools you want to use with details on how to use them to do effective TV journalism. Decide on your plans upon which genre of genre of television journalism you want to project. You can’t just start from scratch and succeed. You will need to define your project. Keep in mind that it doesn’t necessary for such project to focus only on the news. This would be beyond your budget limit, unless you are the legendary CNN journalist, Larry King. When you are about to do such television journalism, think accordingly with the budget and the resources limits. You are not a news broadcaster, unless you got many resources. In stead of thinking of the news, think of how to use the news to produce different television journalism. Think also of the medium you want to use for such project. A media book on iBOOKS? Search, research and study your television journalism theme using the Choose It tool to determine the narrow niches of TV journalism you want to use and get it an inspiring and catching name in few words. The shortest name is better. For example, this term has only 12 characters. It could also be shorter than this, such as TV journal, or whatever name relevant to your theme. Search, research and study your television journalism budget. This depends on the kinds of the tools you want to use. Every element mentioned on the 5 tools above requires a budget. If you are not a professional of any of them, you will need a budget to hire someone to do it for you. You may also need assistants and co-workers. In addition, advertising and distributing requires a budget. However, if you are an educable and inspiring buddy, you could do most of the work by yourself and reduce your budget to the limit you could afford. Take every step in your TV journalism project step by step. This should be well planned, as if you are building a house block by block. For example, the project theme, which is the first block in the building, should have many steps to follow starting from choosing the TV journalism niche name and content. The content is what makes the flow of the body of your TV journalism. It could be in a still picture, or a moving picture with audio and sometimes textual content in few lines either on news bar, or at other spots of the body of the media product, whether it comes in digital and video products, or any element of the 5 elements mentioned above. The aesthetics of this production is that it is not only enjoyable, but it is extremely entertaining and educable at the same time. The end point of it, is to get the spectator mesmerized and inspired to catch up with it and even use it and promote it for you. Well, say that you after reading this inspirational article about TV journalism. To say thank you, use the form below to write what you know about TV journalism, or about what you like in your favorite TV. After that, like, share, or tweet using the small buttons you see on TV journalism. You can also read the updates on this network at your favorite services, such as Google and Yahoo. To do that, press the g+ at the top right corner, or the orange button at the top left congener, or any of the services you see there.